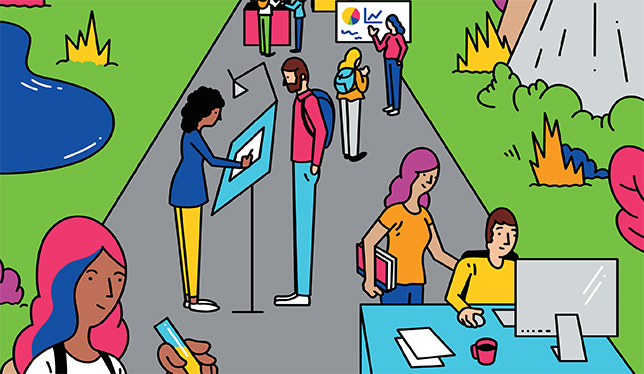 Work-integrated learning grows in popularity at universities across the country. The child of accountants, Vanessa Paulin-Savoie decided in high school that she didn’t want to follow in her parents’ footsteps. She loved reading and writing and did well in French, so she thought a translation degree at the Université de Moncton made sense. The co-op model has a long and successful history at Canadian universities. It was first introduced to Canada by the University of Waterloo in 1957, followed by Université de Sherbrooke in 1964. Currently, about two-thirds of U of Waterloo’s undergraduates are enrolled in a co-op program; at U de Sherbrooke, it’s 40 percent. However, these days co-op education is increasingly coming under the less familiar banner of “work-integrated learning,” or WIL. This bigger tent includes internships, service learning, practicums, field education, entrepreneurial incubators and even capstone research projects applied to community or industry issues. Recognizing the broader focus, the association that previously represented co-op programs rebranded itself as Co-operative Education and Work-Integrated Learning Canada last November. According to the 2015 Canadian University Survey Consortium (PDF), about 55 percent of undergraduate students had engaged in some form of WIL during their studies. Business groups have taken notice: in 2016, the Business/Higher Education Roundtable, a leadership forum for Canadian business and higher education, issued a report (2016) with a goal that all postsecondary students have some form of meaningful work-integrated learning before graduation. The Toronto Financial Services Alliance, a non-profit organization made up of industry, government and postsecondary institutions, was the first to take up the challenge, announcing in 2017 a pilot project called ASPIRE to create 10,000 WIL opportunities in Toronto’s financial services sector by the end of 2020. Governments are also responding. In 2016, the Ontario government called for work-related learning for all college and university undergraduates, following recommendations from a government task force to expand WIL and a report (PDF) from the Higher Education Quality Council of Ontario on how to support such programs. The New Brunswick and Nova Scotia governments have also been exploring how to make experiential learning more widely available at postsecondary institutions. Then, last August, the federal government announced details of a $73-million program to help create 10,000 new, paid work placements over four years for postsecondary students in science, technology, engineering and math (the STEM fields), as well as business. Placements under the Student Work-Integrated Learning Program, or SWILP, will be filtered through selected industry organizations that will also disperse the funds. A further $221 million will fund 10,000 placements over five years through Mitacs, a not-for-profit organization providing research internships primarily for graduate students and postdoctoral fellows. For educators, WIL is about applying different forms of pedagogy, and expanding students’ knowledge and life experiences. But, for students, economics is also part of the equation. They want to make sure they’re in the right program early on and want the experience that will lead to good jobs. At Montreal’s École de technologie supérieure, where all students are required to do three paid internships during their studies, “this gives them a considerable advantage once they arrive on the labour market,” says the school’s director of communications, Antoine Landry. Governments see WIL as a tool to support a strong knowledge economy and provide jobs for youth. Businesses, especially those complaining of skills shortages or mismatches, see WIL as a way to equip students with the skills to move more smoothly into competitive industries after graduation. Meanwhile, students and their families are demanding a surer return on their investment in higher education. “It was really important to be reassured that I was in the right program within the first few years so that I knew I was not wasting time,” says Marie-Pier Harvey, who graduated from the University of Ottawa last December with a commerce degree that had a co-op component. By then, she’d had experiences at four workplaces under her belt: in her university marketing and communications department, with a community mental health agency, an advertising agency and then a Barcelona start-up. International students have shown particular interest in WIL. Some 44 percent of the U de Moncton’s 180 co-op students are international, even though they represent just 17 percent of the university’s roughly 4,200 students. Source: Taking the Pulse of Work-integrated Learning in Canada, 2016, by Academica Group for the Business/Higher Education Roundtable. For Anshuman Ghosh, it was the work-integrated learning component that attracted him to Royal Roads’ global management master’s program. A business professional originally from India, Mr. Ghosh interned with the University of Victoria’s research services office designing business plans for university spin-off companies as part of his program. That “helped me integrate into the Canadian way of working,” says Mr. Ghosh, and it also helped to pay off his student debt. He’s now working as a consultant to several B.C. clients that are seeking trade ties with Asia. Beyond the obvious economic factors, WIL and experiential learning create a better learning experience, say university educators and students, as does the research. When students apply what they’ve learned in class to real-life situations, it helps them to reinforce and understand the role of theoretical concepts. They become more engaged with classroom material, feel more confident in their abilities and can contribute knowledge and questions of their own from their practical experience. Some in the field say that WIL creates a much-needed knowledge exchange between university research and industry. The Halifax-based immune therapy research company Immunovaccine, a Dalhousie University spin-off, is still using an Excel program that a co-op student helpfully dreamed up three years ago to streamline their data-logging processes. “The benefits we get from hiring the co-op students vastly outweigh any initial time it takes for the training,” says Genevieve Weir, the company’s director of research. Immunovaccine provides a standardized training program for their co-op students, who in turn have sometimes pursued more courses in immunology because of their placement experience. As wonderful as the benefits are, there are challenges, and one of the most fundamental is agreeing on terminology. There are a variety of terms and definitions for describing WIL and things related. This is problematic when governments and industry direct money to WIL and universities want to develop programs that meet the funders’ priorities as well as their own pedagogical standards. Business organizations sometimes describe WIL as activities geared towards preparing students for the work world. Educators may define it in more pedagogical terms. If experiential learning is to be recognized as a serious element of a student’s studies, then educators need to figure out how to assess the learning and devise pedagogical strategies for delivering it. Accredited Canadian co-op programs already require student work-term reports as part of their certification, and these usually include both employer assessments and critical reflection by students. Often, students must take classes in career development, too. Now, educators are turning their attention to how to integrate assessment and pedagogical practices into other forms of WIL. At the University of Toronto, about 70 WIL-engaged professors, administrators and researchers meet regularly across all departments to share ideas for developing their programs. All this is happening because doing good WIL takes work. First off, it can be hard to find enough placements. This is especially true if your city’s biggest employer is cutting back: when the federal government cut some 19,000 public-sector jobs in 2012, “it was the worst year for us in 30 years,” says Gaby St-Pierre, co-op director at U of Ottawa. As well, administrators must develop and maintain relationships with community and business partners, handle lots of paperwork and assess and mitigate risks. “If you have students sitting on bums in chairs in an auditorium, it’s probably safer than having them … work on restoration of the shoreline,” points out Trent’s Dr. Bruce. But, she says the pedagogical payoff is worth the effort of managing the risk. And there are other challenges. In some provinces, students on school-work placements are not covered under labour laws protecting other workers. International students, who require a work visa to do intensive paid placements, are ineligible for the new federal program and aren’t always able to get security clearances for government jobs. Arts and humanities students, a higher percentage of whom are female, have been left behind in the more familiar forms of WIL, such as co-op, and have low rates of participation compared to students in STEM disciplines, most of whom are male, and business-related disciplines. David Peacock, executive director of community service-learning at the University of Alberta, is concerned that the new SWILP is too narrow by focusing on STEM and business, ignoring most students and community service agencies that have greater need. Also, with costlier fees, higher required marks and longer time to complete, co-op programs tend to favour more privileged students. Dr. Peacock says that, in his experience, community service-learning does a better job of attracting students who aren’t well represented in STEM co-op placements, particularly first-generation and lower-income students. He adds that, with community service-learning, there are no extra fees on top of tuition. Even though co-op programs have dominated the WIL landscape, participation in them is still relatively low – pegged at 16 percent in a survey by Higher Education Strategy Associates. Universities seem to recognize that supporting other forms of WIL will be key to meeting objectives for higher participation. “For sure, co-op will not be the solution. It’s the Cadillac of experiential learning,” says Claude Lavoie, director of U de Moncton’s co-op education office. Those working in co-op education don’t deny that it is an expensive program to run, but Dr. Johnston of SFU insists that quality WIL also demands additional commitment and possible extra expense. Susan McCahan, U of T’s vice-provost, innovations in undergraduate education, says WIL is a “high-impact practice” but not the only one capable of achieving the “gold standard in learning” – that is, transferring knowledge from theory to diverse application. With this in mind, U of T is embedding reflection and learning goals into its work-study programs so that these, too, can provide experiential-learning benefits. Great article. It’s worth mentioning that the Ontario college system has been delivering WIL through paid and unpaid co-op placements in many of its programs since it’s inception 50 years ago. Well done Moira MacDonald in capturing some of the history, key challenges, and opportunities for WIL as we try to grow and expand quality work integrated experiences offered by PSE institutions across Canada in ways that honour both their pedagogical and business/economic development outcomes. I’d like to learn more from the employers’ perspective on WIL. How do they decide to engage co-op students? What are the challenges of working with institutions and students? What are the costs/benefits?